Some info really needs to be re-done on this page. 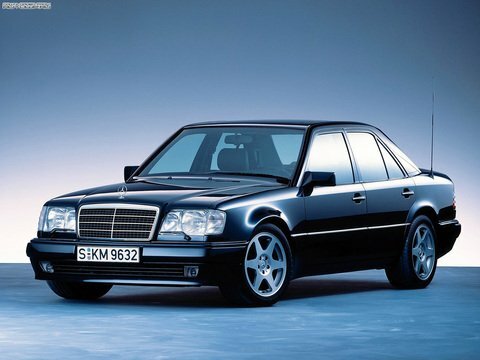 The 500e was introduced shortly in 1990, not 1992. About 50 models were built in 1990. The remaining were built in 91-95. As I already stated, the acceleration times are wrong for the most part. And it has 354 torque, not 355. I do agree with Zach... My car, 1992 500e stock, loaded with two people in it takes 22 seconds to 200 km/h... Alone I am getting around 18/19 seconds. 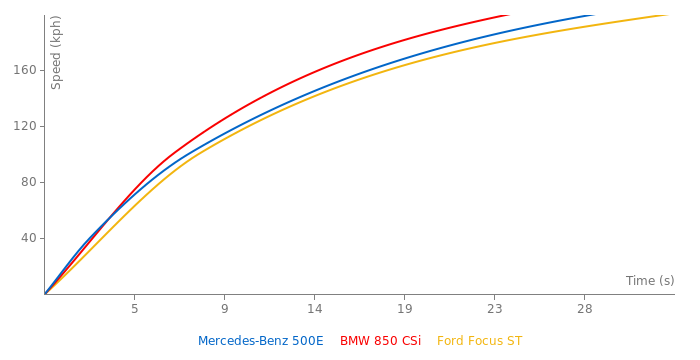 Does anybody have the youtube link or just know the number of the Best Motoring where 500E have been tested with M5 E34 and Aristo? Plz, i need it. NOTE: Acceleration times were tested with the car loaded with 2 people. Any extra weight can make a decent difference in the acceleration times of a car. And I promise you the 0-100mph time is wrong, along with the 0-200kph and 1/4 mile. Almost forgot the weight is incorrect too, it actually weighs more than that. 0-100 mph is wrong too. Which means 0-100 mph should be about 13.8 - 14 seconds. Yeah the 0-200 kph is definately wrong, along with the 1/4 mile time. 1/4 mile is under 14s @ over 100mph. 0-200 kph time should be in the 20-22 second range. Hmmm, so kind of code I think. Also... used to cost to buy new the money of what costs today a Maser 4porte ..in absolute terms..same money 20 years BUT ago.Also the Maser to handle comparatively the same performance weights far more ,exact. weight 500E 1991 ,1680 kgs.AND it does all this without the aditional...tubes...to reinforce its chassis as in Maser. case .Todays Maserati 4porte.It has more or less the technical and road performance with its contemporary the Ferrari Testarossa monospechio prima serie .But it is a SALOON .One of Porsche s ,(almost ,entirelly built in Zuffenhausen),greatest moments. 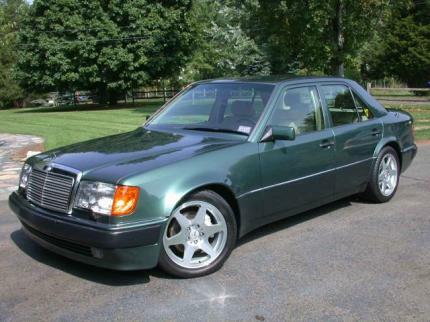 I own one for 10 years now .i used to own 126 cars in my life ,several Ferraris & Porsche s.This one though is by far the most balanced well build car that ever existed .I used it for long Autostrada trips ,fantastic reprise .It is a pity though that some Mercedes dealers are so unhelpfull predatory people .Make no mistake ,this is a super car & when things go wrong is teribly expensive.Merc.spare parts prices are extraordinary expensive .Anyway again is by far probably the best car i ever had .Just watch out for Mercedes people.Last thing the ignition distributors are one of it s week points ,mine twice changed in 20000 km.at 1000 plus eur.at a time .Anyway after 260000 km.loks & drives like new. Added 1/4 mile time from Best Motoring. Yes, I found a BM video with 500E along with E34 in it! Why is this car so unpopular? It was a great car in the early 90's. Because this car wasn't made in large numbers. Unfortunately. I picked up 1 of these 3 months ago. it is by far the best all round car have ever driven. Well, it doesnt exactly scream, hey look at me with my tough name..lol CLK GTR or SLR...is a different story! Because only 670 page views.